Directed by Peter Weir and starring Robin Williams in a career-defining role, the film opens with the commencement of a prestigious all-boys school. There the boys say tearful goodbyes to their parents and get reacquainted with their chums. The strict and disciplined class regiment soon starts and everything is business as usual for these driven boys. However, their new English professor John Keating (Robin Williams) was a former student of Welton, and his teaching style is far from ordinary. His pupils first find him strange and then come to admire his methods. He instills them with the phrase “carpe diem,” has them rip out the stuffy introduction to their poetry textbooks, gets them to see the world from on top of their desks, and encourages them to call him “O Captain, My Captain.” Above all, he leads his students to seize the day, and think for themselves in the process. 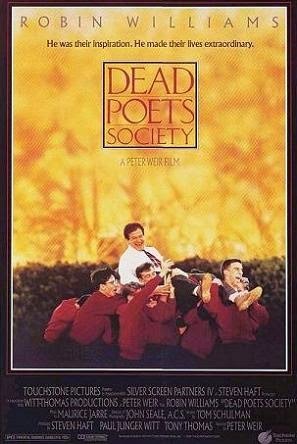 A group of his students re-launch the illegal Dead Poets Society that Keating himself had been a part of as a lad. There they share their thoughts, feelings, and ideas freely in defiance of the school. Charlie (Gale Hanson) for one puts an illicit article in the paper only to follow it by an audacious act that receives retribution from the Headmaster. Knox (Josh Charles) somewhat accidentally meets a girl who he immediately falls head over heels for. However, she already has a boyfriend, but the undaunted Knox will not be deterred, and he keeps seeing her. Against his father’s wishes, Neil (Robert Sean Leonard) takes up acting in a play only to receive his father’s immense disapproval later on. The outcome of this is tragic, and it ultimately leads to an investigation of Keating. Everything seems bleak for the boys as they either rat on Keating or risk expulsion. Keating is released and English returns to the same monotony. However, Keating’s impact cannot be destroyed that easily, and in one last act of the defiance the boys stand up for their Captain led by the formerly timid Todd (Ethan Hawke). I must say that although the film’s ending was inspiring, it left me wondering what the consequences were. Also, I did not really understand the point of The Dead Poets Society. The title would seem to be more aptly Carpe Diem. Putting that aside, there are some good performances here, and Robin Williams is truly a pleasure to watch. He could be my English teacher any day. There are some good lessons to be learned here too. Take note boys. This entry was posted in 1980s, Coming of Age, Drama and tagged Ethan Hawke, Gale Hanson, Josh Charles, Peter Weir, Review, Robert Sean Leonard, Robin Williams by 4StarFilmFan. Bookmark the permalink.